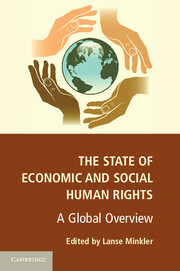 HRI Affiliated Prof. Lanse Minkler Publishes New Edited Book Titled: The State of Economic and Social Human Rights: A Global Overview. This edited volume offers original scholarship on economic and social human rights from leading and new cutting-edge scholars in the fields of economics, law, political science, sociology and anthropology. It analyzes the core economic and social rights and the crucial topic of non-discrimination, and includes an innovative section on ‘meta’ rights. The main chapters answer important questions about economic and social rights performance around the world by emphasizing the obstacles that prevent governments from fulfilling their obligations. The interdisciplinary analysis offers a detailed and up-to-date discussion to help scholars and policy makers find the best ways to instantiate economic and social rights. The authors examine the role of the associated obligations, and especially the obstacles to respect, protect and fulfill those obligations. The book’s introductory and concluding chapters address conceptual issues and correct mistakes often made by critics of economic and social rights. Many members of the UConn human rights community contributed to the edited volume.